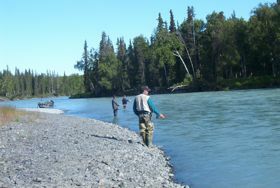 Come experience salmon fishing at its best or venture to nearby lakes for rainbow trout. Our resident guide will take you to the hottest fishing spots while drift boat fishing on the Kasilof. Use our boat pull out after enjoying the river or simply enjoy the view from the 900-ft Kasilof River frontage. Prime dip netting is just 400 yards from our pull out. 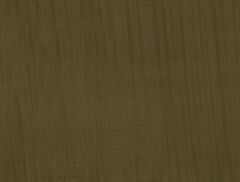 Choose one of the fishing packages below or allow us to arrange a customized package you. 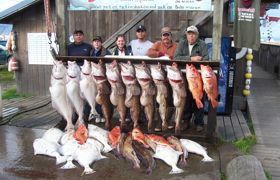 Fishing Packages include accommodations; all necessary fishing equipment, tackle, and bait; and fish cleaning facilities. Let us customize the dream fishing trip for you and your party. 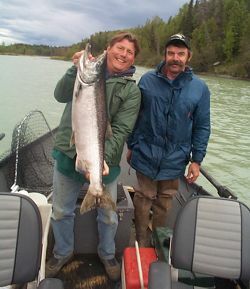 We can also arrange fly-in trips to remote Alaska locations and ocean salmon trips in Kachemak bay. We will show you where to bank fish if you choose to go it alone or combine your fishing with ecotours and sightseeing excursions, clam digging or bear viewing. 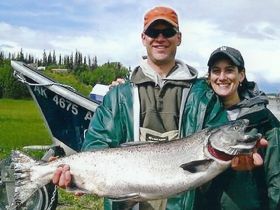 Let us help you make your Alaska trip memorable. Have your fish processed at one of the local processing facilities or let our host teach you to smoke and can or freeze your catch. We have a variety of smoking and processing facilities available to guests.